From his life, written by Alcuin, in two books, the one in prose, the other in verse, together with a homily, and an elegant poem in his honour. Also Bede, l. 5, Hist. c. 11, 12, and St. Boniface, ep. 97. See Batavia Sacra, p. 36, and Mabillon. Annal. Bened. t. 1, l. 18, sec. 4, and Acta Sanct. Ord. S. Bened. Sæc. 3, part 1, p. 601. Calmet, Hist. de Lorraine, t. 3, pr. et t. 1, app. Fabricius, Salutar. Luce Evang. c. 19, p. 442. A.D. 738. 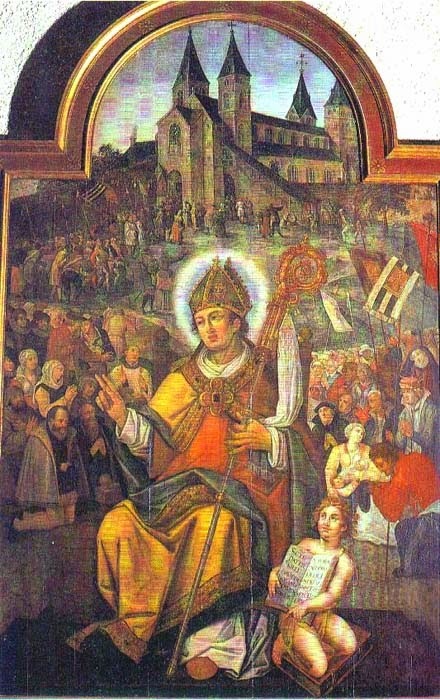 ST. WILLIBRORD was born in the kingdom of Northumberland, towards the year 658, and placed by his virtuous parents, before he was seven years old, in the monastery of Rippon, which was at that time governed by St. Wilfrid, its founder. Wilgis, our saint’s father, retired also into a monastery, afterwards became a hermit, and in his old age founded and governed a small monastery between the ocean and the Humber. He is honoured among the saints in the monastery of Epternac, and in the English calendars. Alcuin has left us an account of his life Willibrord, by carrying the yoke of our Lord with fervour from his infancy, found it always easy and sweet, and the better to preserve the first fruits which he had gathered, made his monastic profession when he was very young. He had made great progress in virtue and sacred learning, when, out of a desire for further improvement, in the twentieth year of his age, he went over into Ireland, with the consent of his abbot and brethren, where he joined St. Egbert or Ecgbright, and the blessed Wigbert, who were gone thither before upon the same errand. In their company our saint spent twelve years in the study of the sacred sciences, and in the most fervent exercise of all virtues. Though his constitution was weak, in fervour and exactness, he outdid the most advanced; he was humble, modest, and of an easy obliging temper; and his whole conduct was regular and uniform. St. Egbert had long entertained an ardent desire of going to preach the gospel to the inhabitants of those unhappy countries, in which barbarism and idolatry still reigned without control, and he had chiefly Friesland or Lower Germany in his eye. But he was diverted from that apostolical design by persons of piety and authority, who engaged him to employ his zealous labours in the islands between Ireland and Scotland, in all which he settled the true manner of celebrating Easter; especially at Hij, where he died a little before Bede wrote his history. St. Egbert is honoured in the English Calendar on the 24th of April. Bede gives a most edifying account of his austere penance, devotion, zeal, and charity. His companion, the holy priest Wigbert, went in the mean time to Friesland; but after staying there two years came back without having met with any prospect of success. This disappointment did not discourage Egbert, and other zealous promoters of this mission; but excited them the more earnestly to solicit the divine mercy with prayers and tears in favour of so many souls, who were perishing eternally. Willibrord, who was then about thirty-one years of age, and had been ordained priest a year before, expressed a great desire to be allowed by his superiors to undertake this laborious and dangerous charge. St. Egbert, by the known zeal and great talents of our saint, and by his cheerfulness, which sufficiently showed him prepared to encounter all difficulties in the prosecution of such a work, doubted not but God had reserved to him the conversion of that nation, and encouraged him in this zealous design. St. Willibrord was joined by St. Swidbert and ten other English monks in this mission. 1 The Frisons, who had formerly occupied a large tract of country on the coasts of the German ocean, crossing the Rhine into Belgic Gaul, had possessed themselves of those provinces about the mouth of the Rhine, which the Catti, who were also originally Germans, then held. 1 Among all the German nations none maintained their liberty against the Romans, with greater success and courage, than the Frisons. Procopius tells us, 2 that some of them came into Britain with the English Saxons: and by their situation they were doubtless the most expert in maritime affairs. St. Ludger 3 mentions that Swidbert, and the rest of these zealous preachers, were desirous to carry the light of the faith to these people, because their ancestors sprang from them. St. Eligius, bishop of Noyon, had preached in part of Friesland, and St. Wilfrid had sown there the seeds of our holy faith in 678. But these seem to have been almost rooted out 4 before St. Willibrord’s arrival in 690 or 691. The authors of Batavia Sacra 5 doubt not but our twelve missionaries landed at Catwic upon the sea, which was at the mouth of the Rhine before it was blocked up with sands, and thither the English were accustomed to export corn, even from the north coasting part of their island; the British tower, as it was called, was built by the Romans at Catwic to defend this harbour. 6 This old channel was not entirely obstructed in 1050, as appears from the Chronicle of Woerden. 7 And Alcuin expressly says, that these missionaries landed at the mouth of the Rhine, and travelled thence to Utrecht, a town built by the Romans at the great passage over the Rhine; whence it was called Trajectum, afterwards Trecht, and lastly Utrecht, (from Outrecht, the Old Passage, and Ultrajectum, or Passage at the town Vulta,) to distinguish it from the ancient town of Maestricht or Passage over the Maese. Pepin of Herstal, or the Big, who was at that time duke of the French, and mayor of the king’s palace, and had lately conquered part of Friesland, received courteously St. Willibrord and his companions. But Willibrord set out for Rome, and cast himself at the feet of Pope Sergius, begging his apostolic blessing and authority to preach the gospel to idolatrous nations. The pope, charmed with his zeal and sanctity, granted him the most ample licenses for that purpose, and gave him a great quantity of relics for the consecration of churches. With this treasure the saint returned with all possible expedition to his province, considering the pressing necessities and dangers of so many souls which called for his compassion and relief. St. Swibert was taken from him and ordained bishop of the Borroctuarians, who seemed to have inhabited the territory of Berg, and the neighbouring country towards Cologne.